An intensive meeting: a wandering with education. The exhibit "linear art" aids the public with the understanding of abstract art. The artist working in abstract art conveys something to us. But what? How does he do that? In the workshops, the student experiences the process. Linear art: in intensive meeting with abstract art. seeing. To retrieve the meaning is a matter of iconography. And that can be taught. A traveling exhibit that touches several provinces. It offers local schools an educational program. space, pattern and composition becomes evident. a method to express what you see and feel through "seeing out loud". If the visible world is not recognizable in an image or painting, then how can the audience understand what the artist wants to show us? Does the artist make a statement about the world in which we live through elevating color and form to independent to independent means? Just as the introduction of symbolism in the genres of biblical scenes and historical pieces is necessary, the viewer has to go deeply into the art and into the imagination of the abstract artist. Inner reality and self-awareness is often the subject of the abstract artist and needs translation. Paul van Rijswijk works with wooden slats and creates structures. He creates autonomous images as well as situation-relative works. During the process, new combinations emerge in form and volume. The geometric-abstract sculptures are clean shapes and transparent in structure. Surprising combinations of compactness and airiness are created through stacking. 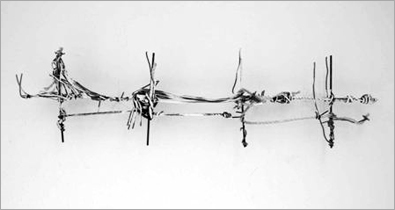 Harmen Abma (deceased) makes subtle wire structures of stiff iron and other building materials. He crisscrosses them with flexible threads and ropes and ties them together. Classic simplicity interchanges with savage motion. Dorien Melis uses cardboard sheets as a skin to write and draw on. She establishes a rhythm,composes and creates atmospheres. Thin lines that describe a landscape, materials that become the landscape. Pip Culbert shows the construction seams of garments, a bag, a tent. The object is reduced to is design essence. The baack pockets of various jeans have their own form and design. With a smile of recognition you discover those differences. Marlies Lebesque starts with experiences that through a visual thought process are transformed. Observations about existence are foremost the starting point. Thus develops the solution. Every unique problem emerges as its own conceptualization. Sigrid Neuwinger: the pleasure of the artist is evidenced by the playing with various materials. Sometimes the sculptures remind us of human forms, then agin they seem like the structure of a building or an architectural object.